Please find below this weeks newsletter. We hope that you find it adds value to your day. Please visit our sponsors as they keep our servers running and without them, we will cease to exist. On large projects, the difference between high tech versus low tech, high quality versus rework, and seamless versus multiple seams can easily translate to millions of dollars in savings or additional costs. Join Burns & McDonnell in a discussion of how technology and efficiency can benefit large linear projects when project processes are designed with that in mind. Learn how Oracle's Primavera Unifier Mobile Application, Document Manager, and Burns & McDonnell’s proprietary geospatial tool OneTouchPM can yield large savings compared to processes that involve a lot of manual work and manpower that still does not promise a high quality outcome. Oracle has some exciting news to share on the construction payments innovation front: Oracle Textura Payment Management Cloud Service since its inception has now been used to manage subcontractor payments on projects representing more than $500 billion in construction value. By streamlining, automating, and standardizing payment management activities—including invoicing, compliance management, approvals, lien waiver collection, and disbursement—Oracle Textura Payment Management helps improve payment outcomes and enable organizations to scale operations for growth. General contractors, subcontractors, and project owners/developers can all benefit from increased productivity, reduced risk, and improved communication across stakeholders from the application, which was launched in 2006. To learn more, visit Oracle Textura Payment Management  or read our white paper  on transforming construction payment management. Now in its 23rd year, EVA in the UK is leading independent event for project controls and earned value management founded and curated by Steve Wake. Originally conceived to champion the use of EVM in the UK EVA has grown in focus and perspective. It champions new thinking and original thought and avoids treading the same grapes year in year out. Possibly the best networking opportunity for senior practitioners and exhibitors in the UK. This year EVA23 will focus strongly on the things that enable us to be ready! Things that prepare us for anything that lies ahead. More than ever a redefinition, a re-setting of what Project Management actually is for, what you use, how you do it and above all, how you communicate with it, is urgently required. The annual two-day conference takes place at the superb Armourers' Hall in Moorgate, London. The event provides an interesting group of high-level speakers covering a range of topics and industries. EVA23 will be different, entertaining and informative. Dinner will be served in the Hall by candlelight. 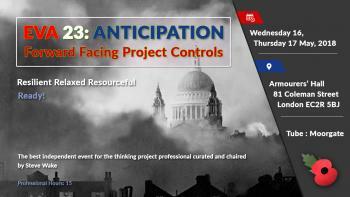 Come along to talk, listen, learn, discuss and see how best to get project controls right. 3 Specialist workshops are also available outside the conference dates. Including Steve Wake introducing EVM and its use as a management tool for the present day. Attendees are middle to very senior professionals with interests in project management, project controls, earned value and keen to learn more about wider issues of transformation, successful change, and benefits-driven portfolios. Attendees can claim 15 hours of professional development on attending this event. It’s not too late to sponsor or exhibit. Sponsor doc available on request. Groups of 4 or more can get a 20% discounted rate or free dinner by applying directly to Steve Wake. Conference on 16 -17 May 2018 Click here to find out more and register . Read More  about how a detailed bridgeworks chart showing the erection of the bridge segments was created, and an overall roadworks chart showing the staging of works was also prepared from the single P6 Schedule using Turbo-Chart. Download  a full featured 14day trial to see how easily you can create Time Location charts you’re your next linear project. You can now find detailed analysis, numbers and statistical data on how PrimaveraReader improves project efficiency and delivers ROI. Download the full Business Case in PDF at www.primaverareader.com . Latest trend in the mining industry – embracing project management solutions . Greenstone Gold Mines, De Beers Canada and Resolute Mining have all recently begun implementing the ARES PRISM suite of software for enterprise project lifecycle management. ARES PRISM provides these companies with a robust solution to manage their project costs, aligning them to achieve success.